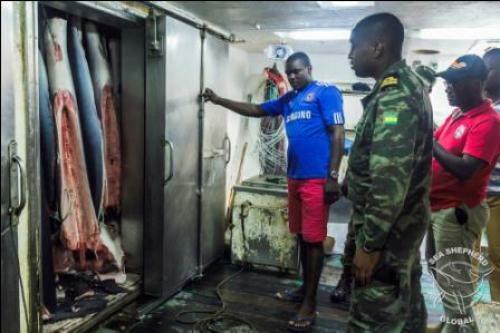 Spanish fishing vessel, Alemar Primero, was boarded in the waters belonging to the Central African island state of São Tomé and Príncipe by the authorities for containing dead sharks. The São Toméan authorities were aided by Sea Shepherd’s crew and law enforcement officers from Gabon. Though the vessel was licensed to fish for “tuna and similar species”, inspections revealed that fish holds of the liner contained blue sharks classified as “near-threatened” by the International Union for Conservation of Nature. It was found that the sharks’ fins had been detached from their bodies, a violation of the European Union Finning Ban, which requires sharks to be landed with their Fins Naturally Attached. The authorities ordered the long-liner to retrieve its fishing gear, release catch and proceed to São Tomé for investigation. With four marines remaining on board for security, the vessel was escorted to São Tomé by the Sea Shepherd vessel, M/Y Bob Barker. Alemar Primero has arrived in the fishing village of Neves where it will remain for investigation while M/Y Bob Barker has resumed patrol. Since April Sea Shepherd’s Operation Albacore is assisting Gabon to tackle Illegal, Unreported and Unregulated fishing. Sea Shepherd is an international non-profit marine wildlife conservation organisation.